Marion Zetland lives with her domineering older brother John in a crumbling mansion on the edge of a northern seaside resort. 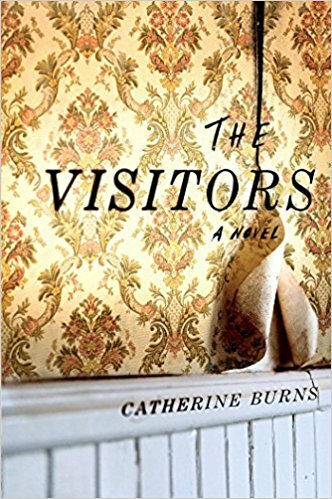 A timid spinster in her fifties who still sleeps with teddy bears, Marion does her best to live by John’s rules, even if it means turning a blind eye to the noises she hears coming from behind the cellar door...and turning a blind eye to the women’s laundry in the hamper that isn’t hers. For years, she’s buried the signs of John’s devastating secret into the deep recesses of her mind—until the day John is crippled by a heart attack, and Marion becomes the only one whose shoulders are fit to bear his secret. Forced to go down to the cellar and face what her brother has kept hidden, Marion discovers more about herself than she ever thought possible. It took me a few days before I was ready to write this review. What a twisted and creepy tale. I had so many feelings after I read this book. I wasn't sure whether to cheer or cry instead I think I was just stuck somewhere in between. Burns has written a truly riveting mystery. I breezed through this book feeling sorry for Marion who is in her 50's overweight and lives with her overbearing brother. They live in their crumbling family home which has become a hoarders paradise. John spends most of his time in the basement, entertaining their "visitors" which Marion turns a blind eye to. We don't really learn much about this until the end other than Marion is troubled by them and is scared to go to the basement. In fact she lives in constant fear of John. It isn't until a tragedy strikes John that Marion seems to get some strength to change her life. It was fascinating watching events unfold from the point of view of Marion, who has an almost child-like quality. Her mother and John have convinced her she is stupid and useless and so she believes it. Its amazing what you can deny but do we really know everything there is to know about Marion? Burns peels back the layers in this creepy character study ending in a stunning conclusion. This is not a faced paced, kill or be killed race to the finish it is a methodical study of a woman who has been controlled and manipulated her whole life but those around her and then finally finding her strength to break free. This family is twisted and nuts and thats what makes it all so fascinating.